If you live in Southern California…a producer from CBS2/KCAL9 news in L.A. has contacted me looking for families to participate in a story about families raising a gender fluid child. Please email me at raisingmyrainbow@gmail.com if you fit the bill, are willing to be interviewed on camera and/or want to learn more. If you live in Los Angeles…The new site Spectrum Los Angeles is your online guide to LGBTQ L.A. On Spectrum you’ll find feature stories about LGBTQ organizations, profiles of interesting LGBTQ folks and information about upcoming community events. For regular updates from Spectrum, you can connect with the site on Facebook and Twitter! 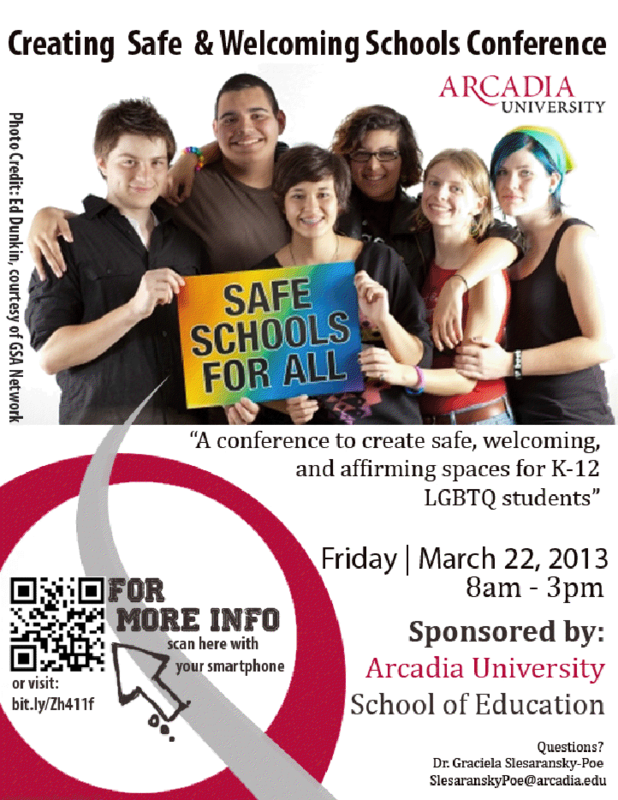 If you live in the Philadelphia area…you should check out the Creating Safe and Welcoming Schools Conference at Arcadia University on March 22 from 8 to 3 p.m. It will be beneficial for educators, Gay Straight Alliance members and parents raising gender nonconforming/LGBTQ kids. For more information and to register go to: www.arcadia.edu/safeandwelcomingschools. This entry was posted in All Posts and tagged CBS, Los Angeles, Spectrum Los Angeles, Welcoming Schools. Bookmark the permalink. Thank you, CJ’s Mom! I attended the conference at Arcadia – I wouldn’t have known about it without your post – and I learned some great things while meeting fantastic people. Live just down the street from Arcadia. One of my best friends and several teachers from my kids’ school are presenting at this conference. Will you be there? Thanks for helping get the word out.